The movie opens with an ultra-secure mobile prison in a train carriage heading towards a fortress with a high value prisoner on board. But the prisoner is of interest to some other people: a team of ageing human sandbags, who try to spring the prisoner the only way they know how: from a helicopter with huge amounts of explosives. And so begins The Expendables III. These films are about two things: the action and the cast, and part 3 delivers both. It features ex-diver Jason Statham, ex-tax evader Wesley Snipes and ex-actor Sylvester Stallone with a roster of other big names and big bodies in the last of Stallone’s 80s-throwback action trilogy. Stallone looks like Simon Cowell’s plane crash-landed in the jungle, and he survived by eating the rest of the passengers and the jungle – by which I mean he’s in incredible shape for a man pushing 70. Harrison Ford is a welcome addition, taking over from boring, wooden Bruce Willis after the star demanded a million dollars a day for the film. Ford is a unique icon who brings a sense of fun missing from Willis’s general person. Mel Gibson is the best villain of the trilogy (sorry Jean-Claude) bringing his still well-honed acting skills, and Antonio Banderas is an unexpected highlight as motor-mouthed Galgo. But there are also some less well-known faces. Stallone’s Barney Ross retires the old gang in favour of some young guns carrying… newer guns, meaning a further half dozen characters are introduced to an already massively crowded film, like a post-apocalyptic Picadilly Circus. In some respects this benefits the plot, and means it isn’t just the same guys in the same situations we’ve seen twice before, but when they’re all onscreen together there are too many people to keep track of, and we’re left wishing the attention was more focussed on the old guys. Not seeing Jet Li do any martial arts is a particular disappointment. This is the most well-rounded of the trilogy. Part one was just a poor-quality action film and part 2 delivered the action and comedy, but had no plot whatsoever. Part 3 is less funny overall, but the story gives all of its vast cast something to do, rather than just walking on, saying a catchphrase, then leaving. The action is spectacular, and there’s good interplay between the characters, even if some of the acting leaves a lot to be desired. But this is actually a fairly decent action film in its own right. 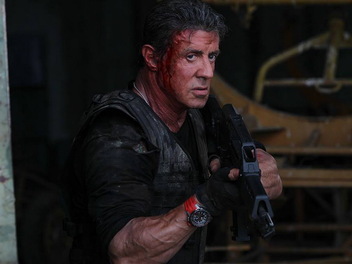 The novelty of seeing famous people together in a film has worn off, or has been killed off, if you saw Escape Plan or Grudge Match, so Stallone has wisely given this third parter more substance than before. The resultant film is a fun festival of fighting, a glorification of geriatric gun-wielding and a celebration of steroid-enhanced silliness.